The biggest challenge facing many game programmers is completing their game. Most game projects fizzle out, overwhelmed by the complexity of their own code. Game Programming Patterns tackles that exact problem. Based on years of experience in shipped AAA titles, this book collects proven patterns to untangle and optimize your game, organized as independent recipes so you can pick just the patterns you need. You will learn how to write a robust game loop, how to organize your entities using components, and take advantage of the CPUs cache to improve your performance. You'll dive deep into how scripting engines encode behavior, how quadtrees and other spatial partitions optimize your engine, and how other classic design patterns can be used in games. Start reading Game Programming Patterns on your Kindle in under a minute. I must chime in with the others. This book is a fantastic book for programming in general, not just for games. It has a crystal clear look at how to be the benevolent architect of a very complicated piece of software without getting lost in exactly how your particular language does something. The code samples are technically C++, but are written so cleanly and stripped of all unnecessary parts that it feels like pseudo-code. Also, you can read the whole thing online right now. It's funny, it's an unbelievable game-maker spirit animal guide, it'll make your code better. Go there, use it, and come back and buy a copy. I bought the hard copy because I wanted this guy to get something for his incredible effort. Also, it looks pretty, and as he says, "doesn't need batteries". On that note, it's incredibly well typeset and laid out. I couldn't be happier with the book. 56 people found this helpful. - a modern re-contextualization of the Gang of Four book. - not a book for discovering new and exotic design patterns. - a book that essentially goes through a list of GOF patterns and gives cleaner definitions and examples in the context of game development. - explanations are not only clear, but the concepts in each chapter start with the naive implementation, then gradual design improvements are added along with examples of how re-usability and de-coupling is improved. It's also an iterative process where there is a story being told about how the code is improving at each step. - Doesn't focus on a single project, or even smaller ones. There is no complete and running code in this book. It will give you examples of small problems that can be solved using the design patterns. - This book ages better than a more technical book because it decouples itself from technology, and focuses on addressing how code is designed. - There is a scary picture of the author on the back of the printed version. This is an awesome book that is a must have for any software developer. Though experienced with general programming building boring office software I had always wanted to make video games but always found the mere idea of writing a video game to be an intimidating venture but this book gave me confidence because the author presents the architecture of a game in an easy to understand matter not from an academic perspective but from a perspective of experience given the author used to be a developer with Electronic Arts. The author even mentions some caveats with the patterns presented under certain scenarios and then gives some ideas on how to work around them which is great for an over thinking over engineering fellow as myself. If this book were to have an alternate title it would be, in my opinion; "Game Programming Demystified." Though the contents are available for free on the author's website I bought both the physical book and the Kindle version on release day to support the author's awesome work. As I recall the author started writing this on his own initiative while he worked at Electronic Arts and later published it in book form only after overwhelming demand. I am extremely appreciative of the author's generosity and him taking the time to share his industrial knowledge. 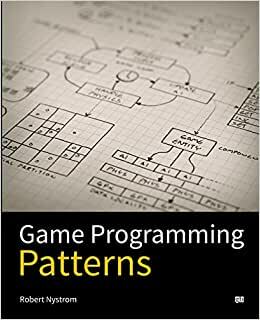 Being based largely on the original set of patterns outlined by the Gang of Four, anyone who has been a software developer for a decent amount of time, whether in the game industry or not, is very likely already at least passingly familiar with the patterns outlined in this book. Even so, I genuinely enjoyed the book's approach to explaining the patterns and how they might be best applied to game development specifically. It is written in a clear and very understandable style, with excellent examples and detailed explanations. Beginning gamedevs should be able to easily implement any of the patterns from first principles in their chosen programming language after reading the book, and even experienced gamedevs will appreciate the straightforward way that this book explains the subject matter. I would strongly recommend this book as essential reading material for anyone new to game development. 5.0 out of 5 starsGuide on how a problem can be solved, finding flaws and improving existing code. Fun to read. Not only that the book informs the reader by using very specific examples when applying various patterns, but the author made sure the reader is guided from finding the proper solution up until finding possible flaws. While the book can be used as an absolute go to when trying to find a solution to your implementation I would suggest to take the book as an engineering course; it does show a good amount of patterns but doesn't leave those simple. It strips the pattern "it's shell" showing the good and the bad, where it can be applied and how, where it would fail and why, how to mitigate and further more. The book also contains code examples written in C++, but well organised and written such as even with 0 C++ experience, one could 100% understand! Additionally the book feels like a conversation with the author due to the pitch perfect puns and parentheses. The author's game development experience is shared among those rows.